Life with the Stewarts: Trenton John Stewart has arrived!! Trent is here!!!! 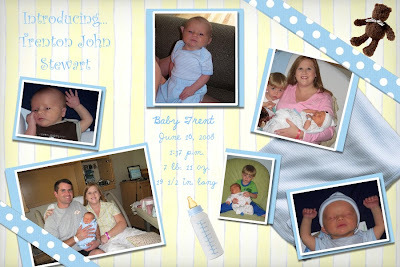 He was born on June 16, 2008 at 1:37 p.m. by c-section. He weighed 7 lbs. 11 0z. and was 19 1/2 inches long. He is absolutely perfect. He has dark hair and an olive complexion-not at all like his mom! I think he looks like Hugh, but many say he looks like Spencer. We will see! We were so happy to have a healthy baby. He didn't have to go to the NICU!!! We were able to see him, hold him, and have him in the room with us immediately following delivery. This was a new experience for us. We were so fortunate to have my doctor, Allison Heaton, deliver Trent. I was scheduled to have him on the 18th, but plans changed when I went for my appointment on the 16th. I had my weekly ultrasound to check the amniotic fluid level and my non-stress test. During the non-stress test, I was having pretty hard contractions-more than I had ever had. Dr. Heaton decided that she didn't want to wait to do the surgery. She said, "How about 1:30 today?" Of course I said YES!! It was a rush to get the family notified, get Hugh to the hospital, and most importantly, make sure Spencer was taken care of and got a NAP!!! Everyone arrived at the hospital before the surgery, and Hugh and I got to spend some time with Spencer before I went back. That was much more emotional than I had expected. He wasn't going to be my baby after today. 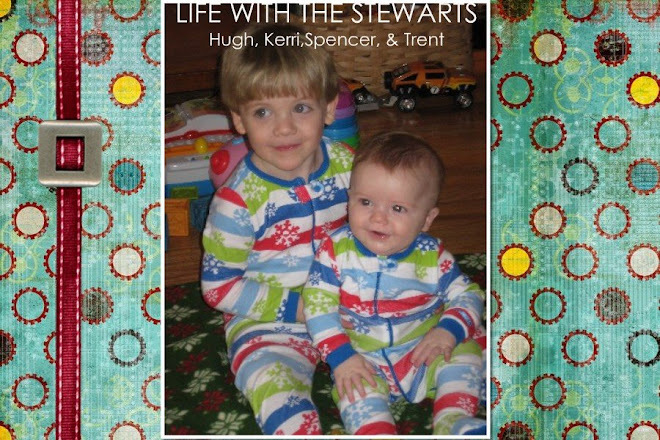 As I was in surgery, Dr. Heaton asked Hugh and I if we were done having kids. We said we weren't sure yet. The reason she was asking is because she saw a problem while operating. Because I had a prior c-section with Spencer, I had an old incision on my uterus. She said she saw a window (a thin layer that you can see through on my uterus). Actually, it was a hole opening up on my old incision. She said that it could have been a matter of 3 minutes, 3 days, or 3 weeks, but my uterus was on its was to ruptering!!! She said that if mine had ruptered, it could have taken my life, Trent could have been stillborn, or I could have had a hysterectomy. She said we skated by again this time! (Remember, I had a placental abruption with Spencer.) Dr. Heaton said she was so glad that she followed her gut and did the surgery on Monday instead of waiting until Wednesday. Who knows what could have happened! Needless to say, we feel blessed to have 2 healthy boys. Hugh and I are counting our blessing that Trent arrived safely. Thank you for all your prayers for a healthy pregnancy and delivery. I promise to post more soon. As you can see, it has taken 11 days for me to get this post done!! Enjoy the slideshow. YAY!! Congratulations!! He is so beautiful and I can't wait to see more pictures of him!! He is absolutely precious. I'm not just saying that because we're related! He really is beautiful! I'm so thankful for your Dr.s wisdom and God's protection of you. Praise Him! I'm glad you're doing well. Wish we lived closer so we could meet him. Kerri, he is beautiful. I can't wait to see him when I get back from vacation. Can you believe we both have two boys now??? Try to get some rest if you can. See you soon! wow, he is beautiful! congratulations! and praise the lord that you both are ok!